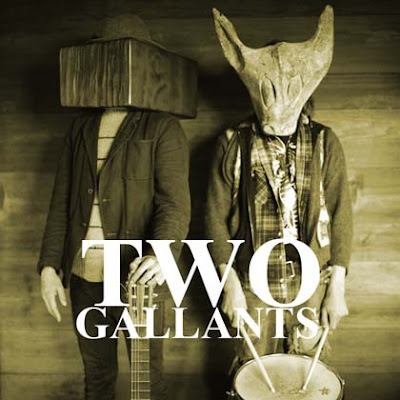 San Francisco's Two Gallants (MySpace) will be playing at the El Rey tonight with Bltzen Trapper (MySpace) at the El Rey in Los Angeles tonight (good representation of the West Coast, huh? ), so if you're around, looking for something to do, or some combination of the two, then perhaps tonight is your night! The duo's Adam Stephens and Tyson Vogel play meticulously crafted, beautiful folk that springs from the pair's "honest, deep connection built on trust and respect" for each other. There's a tenseness to their sound that sets them apart from others in the folk/country/blues genre of indie rock/pop, and to me at least, that's the main selling point. If you're not convinced, check out a couple songs below, but definitely try to make the trek over to the El Rey tonight if you can! It'll be a great show! holy pancakes, they don't even need butter.